Rosie's stage career started after publicly crying at her first Toastmasters meeting. They asked some very difficult questions like, "What is your name?" and "Where are you from?" Rosie graduated WIT in 2016. She has since completed the curriculum at Dojo Comedy where she currently plays on the team Maple Sunday and teaches new improv students Zip Zap Zop. She has taken a lot of improv workshops. One of her favorites was the week-long Kevin Mullaney intensive where she learned to make eye contact with people for an uncomfortably long time. She plays on the indie team Trustfall and enthusiastically runs the social media for 3 improv instagrams in DC. 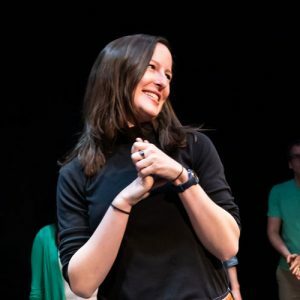 One of her favorite things about being on Trustfall is getting to put together the monthly show Trustfall & Friends, and see some funny people of all experiences play every month. Rosie hails from Washington DC and works at a museum downtown.